Saturday, May 19th. I can't remember exactly what caused this tear, but I don't remember anything bad happening. After whatever said incident was, we packed up and headed to target. Dad and I jousted with the noodles and ultimately not to purchase. We made a side trip to Trader Vic's...er Joe's (I always get those mixed up) where I walked away with some stickers. Before Libby headed over to watch me (mom and dad had another play to go to) I did a little hiding and seeking...mostly hiding though. I thought the cupboard pure genious, but dad found me in under a minute. Mister Jason came over on Sunday morning. He was at the hospital the day after I was born, but I didn't we just missed each other (I was in the NICU) and I vaguely remember meeting him one other time. He's been away at school for well over a year so mom and dad threw a little welcome back shindig and he spent the morning with us as well. After breakfast we headed to his church for some "hallelujah" time. Jason's friends said I behaved very well, but mom was a little skeptical based on the "running down the side aisle incident". After a whole house nap, the party started. As you can see, all of my friends made an appearance! And the slice of watermelon in my hand below might have been number 6. I lost count after 3. 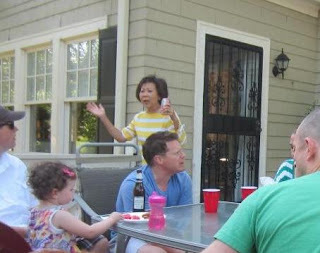 You can tell by this picture that Ta is recounting her "fish this big" story. You know, that Evan is a cutie, but his little bro Zach is going to give him a run for his money. Here are Avery and I discussing the semantic contributions of dodgeball. After agreeing to disagree, she put me in a choke hold. We thumb wrestled and called it a truce. Mister Jason, I rather enjoyed spending the day with you. It took me a little while to warm up, but I can easily see why mom and dad love you so much and can't wait for your more permanent Welcome Home!